Aeyess is the singer-songwriter-author of the Armstrong Dent book series and soundtrack. His stories have been purchased and downloaded hundreds of thousands of times, having reached the top 25 overall on Amazon. Each of the 10 stories reached #1 on Amazon’s Short Reads Chart in 2015. The preorders of his new cover of Nothing Compares 2 U, a tribute to Prince, reached the Top 100 on Amazon on the first day. Aeyess is the first person ever to write a book series and write and record an original pop soundtrack to accompany the books. Armstrong Dent is the leader of a unique team of special ops agents made up of famous celebrities, each with a highly specialized talent. The team’s white hat hacker is a multi-billionaire tech entrepreneur, the cryptologist is a best-selling author of conspiracy novels, and the team’s linguist is a Grammy Award-winning musician. In all, ten team members rotate in and out of the stories. All ten of the stories in the series have reached #1 on the Amazon Kindle Short Reads Chart. Aeyess writes, films, and edits his own short films and music videos. The video for United States of Arrogance was based on a United States Government propaganda video from the 1970s. The video was directed by Aéyess and features animations by Vincent Collins. He is currently filming a series of short films including the short film for Nothing Compares 2 U which will be released soon. 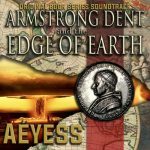 Armstrong Dent and the Edge of Earth is an 11-song pop album in the spirit of the classic movie soundtracks. Aéyess wrote, produced, and performed the songs. The album was completed at Lucasfilm’s Skywalker Sound. The album’s consulting producer is multiple Grammy-winner, Leslie Ann Jones, a past Chair of the National Academy of Recording Arts and Sciences Board of Trustees, the organization that awards the Grammys. “I first came across this unique artist when an email showed up from a book promotion site offering some kind of deal on one of his books. Armstrong Dent and the Whatever Blah Blah. I ended up clicking on it, adding some more pointless content to my Kindle I’d never get around to reading. But, this time I was sitting on a shuttle bus, to pick up my car from long-term parking at Reagan International, and for whatever reason I tapped the cover. Within seconds I was an Armstrong Dent fan. I finished the entire story in the fifteen-twenty minutes I waited for the silent electric vehicle to make its way to my far flung lot. Before I even reached my car I had downloaded the entire series. “Fighting ain’t no lazy man’s game. Anybody tell you anything different is a fool or a liar. I got no room in my world for folk who can’t see a fox for a fox. And when they drop they shoulder, I go for the kill.” Meriwether Falls watched himself on the television screen and popped his knuckles. The veins in his neck bulged through his dark black skin. His bald head shined from the studio lights. Six years as the undisputed, undefeated heavyweight champion and all he could think of was the days he spent living in the back of Old Man Gravely’s garage – Sixteen-years-old and ducking the authorities because he knew he didn’t belong in a foster home. The man of the house always afraid of him and the woman – well, he wasn’t good around any woman, no matter her age, or his. Excerpt from the short story Armstrong Dent and the Death Blow. I sneak away without saying goodbye. You don’t see me. You don’t see me. Armstrong Dent and the Edge of Earth – In this novella, the world’s most famous secret agent, and his team of celebrity adventurers, must overcome a terrorist who intends to use an ancient biblical relic to destroy the world. The team will have to transform the opinion of the American government which intends to shut them down or allow a new shadow world government to assume control of the entire world. This book reached #1 on Amazon’s Short Reads Chart and number 25 overall amongst all books on Amazon.com. Over 100,000 copies of this book are in the hands of readers throughout the world. The first season includes 10 short stories that culminate in a novel that is currently being written. All 10 stories are available excusively at Amazon.com.